This past weekend we flew on a Northwest flight from Tampa to New York LaGuardia to stay at the W Times Square. I paid for the ticket from Tampa to LaGuardia, since the flight was only $199 we thought we could get better use of our miles elsewhere. 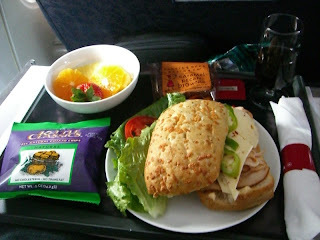 The Northwest flight was on an A320 airplane and we were in seats 2A & 2B. 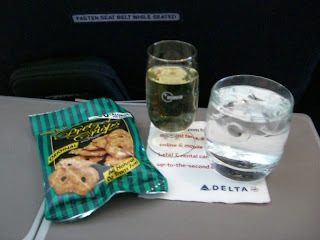 Since I am Platinum on Delta I was upgraded at the 5 day window. But my wife only has Silver status she was worried that she’d have to take my first class seat while I sit back in her coach seat. But she ended up being upgraded within the 24 hour window because of her Silver status. Check in was easy using the kiosk, although we couldn’t check in at the Medallion desk since the flight was operated by Northwest and the ticket was issued by Delta. First class was 100% full, and coach looked to be about the same. The seats were the old cloth Northwest seats as opposed to the new Delta leather seats. I find these seats more comfortable when compared to the Delta leather seats, but I’ll take either any day over coach. 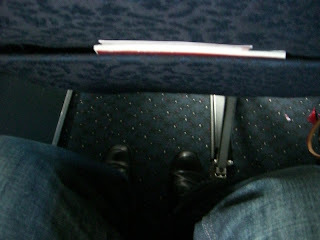 Here are a few pics of the leg room and the inflight service. The A320 flight was smooth with very little turbulence. 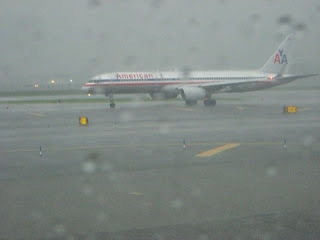 When we arrived at LaGuardia there was a big storm coming through that shut down the gates due to lightning. We ended up sitting on the taxi way for over 45 minutes until the storm passed. It was great that my wife was able to upgrade using her Silver status. We checked every day within the 5 day upgrade window and at any point there were no less than 10 seats available for sale in first class. This was a quick an easy flight and the service was great.